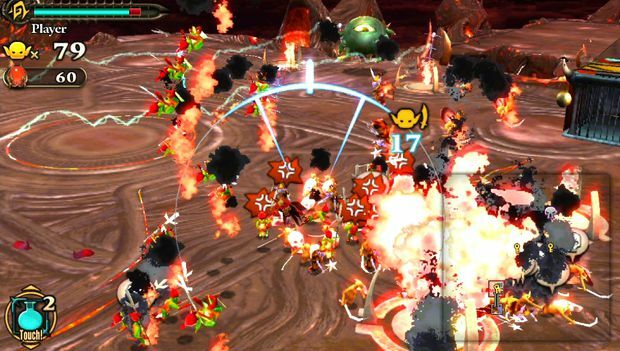 Imagine Pikmin with demons and death metal -- that's kind of like what Army Corps of Hell is. Instead of commanding cute little plant-like creatures in an oxygen-heavy forest, you'll command nasty goblins in the bowels of flaming Hell, playing as the former King of the land. You'll send your minions to devour demon corpses, with guts and blood flying in every direction, but there's little time to enjoy the spoils of war as the biggest beasts of the underworld are right behind you, waiting to rip you and your army to shreds. 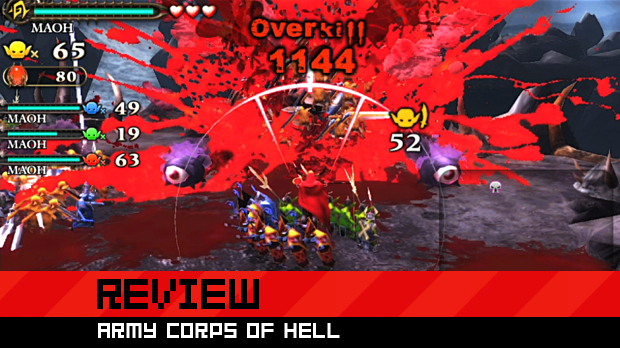 Like Pikmin, Army Corps of Hell is a charming game. Army Corps of Hell kicks off with the King of Hell being knocked off his throne, sapped of all his power. He's merely a skeleton with a cape now, but he still has the strength to gather up the dumbest of goblins to create a small demon army that will help him work his way back up to the top. Through small victories and brutal looting, the King is able to gradually grow his troops to be strong enough to reclaim the throne. 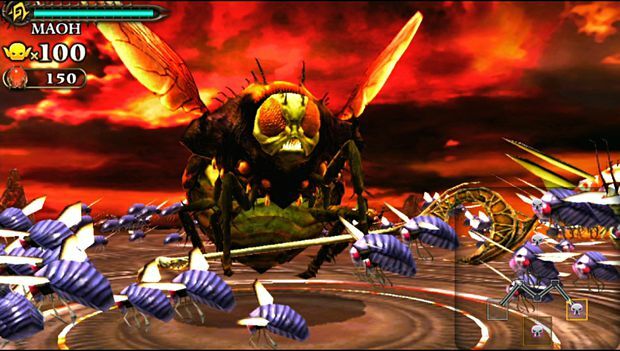 Gameplay has you hovering (the King of Hell does not walk) around small floating square hell-islands, commanding your demon armies to attack waves of enemies, which are sent forth through a round half-circle aiming guide. You'll start out with soldier goblins, which will jab at and rip apart anything within range, serving as the most basic attacker type. 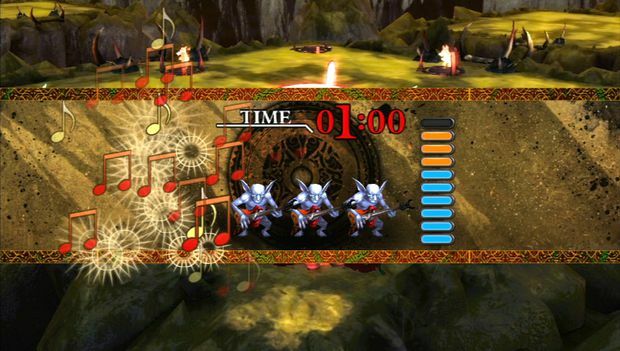 Later you'll acquire spear-wielding goblins, which can be sent as a group to attack at a longer range. Finally, mage goblins can cast projectile elemental magic in a sort of middle range, with automatic targeting that manages to go beyond Hell's many fire and thunder traps. And that's really it. The King of Hell steadily grows his forces to include a huge mix of the three types, and has to use them in the proper way to take down enemies. Lather, rinse and repeat. You can grow the powers of your army through looting and alchemy, giving Army Corps of Hell a bit of customization options to spice up the action play. Sending your demons to gnaw on the remains of defeated enemies brings about rare items, and these can be used in an alchemy menu to create better weapons and armor for your troops. Upgrades and status-aide items can also be purchased with another type of loot. For these reasons, you'll want to be sure to loot every enemy you kill after each wave is complete. Unfortunately, for some inexplicable reason, the looting process takes way too long. It's funny to see your horde rip apart an enemy the first few times, but it grows old quickly, and starts to feel tedious after the initial stages. Army Corps of Hell will have you grinning from the get-go with its over-the-top bloodletting, dark visuals, and Japanese heavy metal score. It makes a great first impression. The super violent gameplay is also quite entertaining at first, though that feeling does eventually wear off. And that's really the biggest problem with this game: it's the same thing, over and over again. The gray, brown, and red color palette rarely changes, the small island-like battle zones are too confining, and all the enemies start to look the same after awhile. The attack strategy rarely changes: you'll use soldiers to mow down big guys, spearmen to hit threats in the distance, and mages to take out everything else. Occasionally, you'll need to use a special item, which usually involves tapping on the rear touchpad to play status-buffing war drums, or strumming a guitar to increase attack. Boss battles are the only exception to the repetition; they're huge, involving, and the ugly beasts are quite difficult to take down. They're like a reward for working through the same old waves. As the number of enemies in the waves increases, so does the feeling that you're playing a type of shoot-'em-up. Before long, players will find themselves solely focused on dodging enemy projectiles, mashing the X button to dash out of the way of obstacles, enemies, and fire while holding down the R button to fire and/or attack. And just like in any good shmup, the ends of the stages are marked with monstrous bosses that have multiple weak points you have to take out. 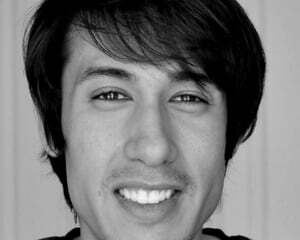 This game is a lot of dashing, dodging, quick attacking, and more dashing to recover. The upside is that it's all very action-oriented, but the downside is that it's also highly repetitive. Army Corps of Hell supports ad-hoc multiplayer for up to four players. 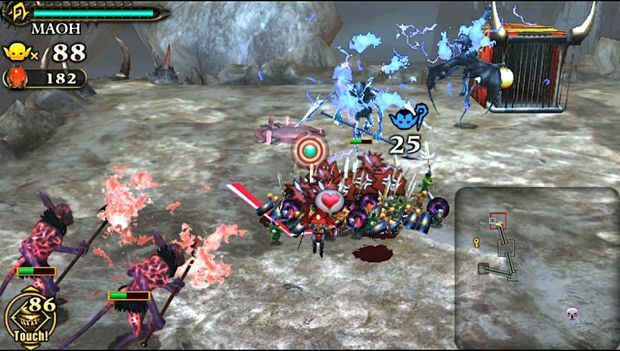 Players can work alongside each other as a combined force to retake Hell, coming together to devise strategies, but they can also go at it competitively, with the stealing of other player's troops as a possibility. Don't let Army Corps of Hell's repetitiveness scare you off. I'm well on my way through a second play-through of the game as I find the tense, fast-paced demon mowing quite enjoyable. Despite its faults, it's really easy to get into and has lots of satisfying action. It may not be the best-looking game in the Vita's launch line-up -- and it's definitely lacking in the variety department -- but the frantic gameplay and the insane death metal soundtrack help take the sting off. Go ahead, go to Hell.